I’d recommend that we all spoil ourselves with flowers. Not, for the hell of it, and not any flowers. Just those delivered by Bloom & Wild. Their story is not about flowers, no matter how beautiful they are, its about disrupting a market with one decisive initiative as its origin. 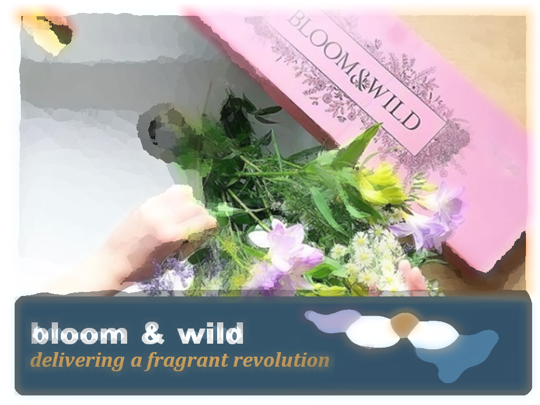 Bloom & Wild are the original “letterbox” florists. As you might imagine this means that flowers are sent directly through you letterbox. Take any nightmare visions from your mind of flowers being forced through your doors like Christmas trees through a shredder. In fact, cast out of your mind any notion of nationwide chains of delivery men or ladies driving to your doorstep. The problems with delivered flowers are both generic for all home delivery but also specific to florists. The specific issues are related to the variable quality of the blooms, the inconsistent levels of display and the service itself. These can all be far away from our ideal. The generic issues of no-one at home or expensive delivery slots, are also be worse for flowers by destroying the element of surprise that a delivery of a flower bouquet is designed to create. The decisive initiative is therefore to deliver flowers in a box the size of a letterbox. More accurately slightly smaller than the average letter box so that the box can be delivered through it. Instantly, issues regarding delivery dissolve into thin air. A surprise indeed for someone either at home or arriving after the event. However, the smart thinking is still to be unwrapped. Firstly, the boxes are beautifully designed and themed. So, these are not just safe vessels of carriage but statements of beauty in themselves. Secondly, the individual blooms are wrapped in protective tissue and “nets” to keep them safe. The practical act of protection is transformed into an unveiling of exclusively selected stems individually wrapped. By design, the whole process of unwrapping inspires the recipient to inspect and enjoy every floral element of the display. Something never done with a delivered bouquet. The chore of delivery is transformed into the joy of discovery. The experience is further added to with recommendations and guidance of how to display the various flowers. This can be enlarged upon through videos on the website, and even the visit to a dedicated Bloom & Wild workshop coming to a location near you soon. Magically, arranging your own flowers becomes an achievement instead of an inconvenience. So, there we have Bloom & Wild. National flower delivery is common place. Making flowers beautiful is nothing new, nor is learning how to display them yourself. However, delivering all of this through a letterbox is clever. And the sizing of a box to make this all possible is extremely clever. A simple disruptive idea. Delivered beautifully. What’s the decisive initiative waiting to be discovered in your industry? Do you suffer from…” we’ve always done it this way!”?